For Mary Voyatzis, the ruins of the Sanctuary of Zeus on Mount Lykaion in Greece and the rock-strewn landscape that surrounds it hold stories of ancient people who traveled to the shrine from distant places. Now, a new grant will help Voyatzis, a professor in the School of Anthropology and the Department of Religious Studies and Classics, continue to study the mobility of these people and animals using isotope geochemistry to analyze trace elements in bone and teeth. 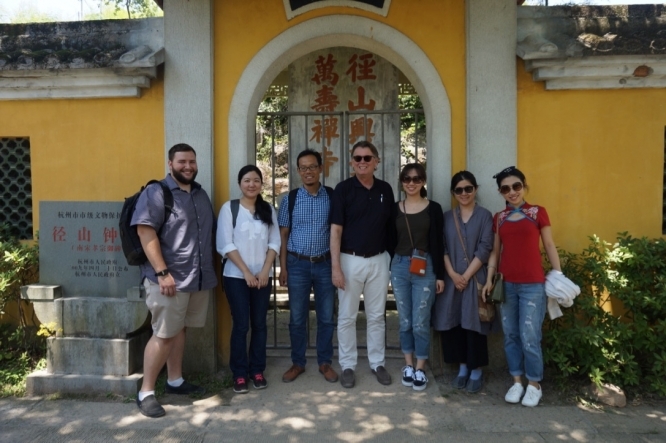 Voyatzis is among the first cohort of recipients of the International Research and Academic Program Development grants, a new program co-sponsored by the office of Research, Discovery & Innovation and the Office of Global Initiatives. With the goal of empowering faculty while providing a global benefit, seven proposals were selected, each with a high probability for success, strong international partners, and a vision for future sustainability. The grants are peer reviewed, open to all faculty, and span disciplines and subject matter. "Supporting faculty who are preparing to submit transdisciplinary-investigator, globally oriented, innovative research proposals is crucial. The IRPD grants provide faculty with resources to establish collaborative frameworks, assemble transdisciplinary partnerships and collect essential data required for competitive external funding," said Kimberly Andrews Espy, senior vice president for research. "Congratulations to the first cohort of IRPD grant winners! I look forward to hearing updates on current and future research impacts, particularly in terms of how the work benefits communities and society." Designed to leverage existing relationships, develop new partnerships, and capitalize on synergistic skill sets, IRPD will fund two tracks – the first to develop scalable and ongoing transdisciplinary international research collaborations and the second to develop new academic programs with international partner institutions. "IRPD grants assist faculty in advancing existing international partnerships – coalescing research and academic partnerships into comprehensive programs that begin to address some of the world's most pressing challenges. Given the timing of the first funding round, the 2017 winners are clustered in the research track," said Randy Burd, associate vice president of global research alliances. "In the next round, we look forward to receiving proposals that will build cross-cultural, cutting-edge academic programs for the future." "CATS Patient Evaluation and Monitoring After Heart Surgery." The grant will further enable international collaboration on hardware and software tools to automatically monitor cardiac patients after surgery and will offer researchers access to a wider range of patient populations. "Transnational and Transdisciplinarity Research: Imaging in Mining Geomechanics." Kemeny's team will be working with scientists at the Indian Institute of Technology Kharagpur to address problems of engineered structures in rock and soil. "Digital Border Dialogues: Identity, Interculturality and Educational Empowerment." Kralovec's work is designed to empower students through identity dialogues involving schools from the Finland-Russia and the U.S.-Mexico borders. "Shared Populations: A Multi-Sited Research Collaboration with Mexico." The goal of the collaboration is to study how transnationalized families – those shared by both the U.S. and Mexico – are impacted by greater immigration enforcement, including an increase in policing and removal, in the U.S.
"U.S.-Russia Dendrohydrology of Complex River Systems." The grant is providing Touchan's team with travel funds so they can meet with colleagues and present project goals to the National Science Foundation. In September, his group will go to Russia to identify potential tree-ring field sampling sites to study streamflow variability in Siberia's Yenisei River within the context of climate change and water balance. "The Hangzhou Region and the Chinese Creation of an East Asian Buddhism." The aim of Welter's research is to develop a greater understanding of the historical rise of East Asian Buddhism. The due date for next year's applications is March 15. For more information about applying, check out the Research Gateway page.